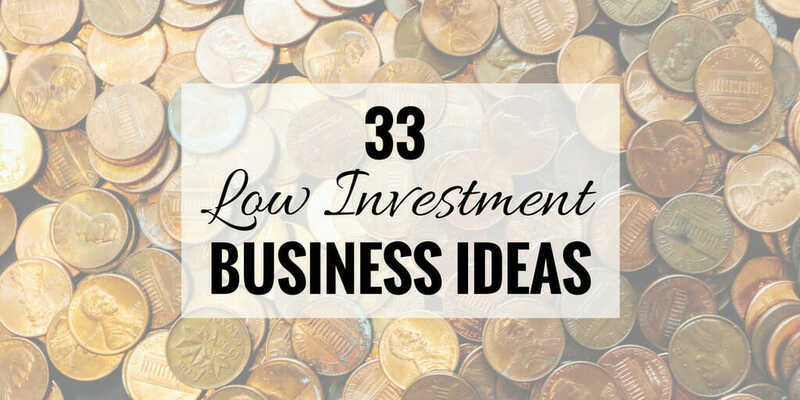 33 Low Investment Business Ideas You Can Start Now! What kind of business can I start without a lot of money? There are several small business opportunities which require little to no upstart costs! Of course, they’ll still require time and effort. Additionally, many of the small business opportunities play to the strengths of skill sets involving computers. I also included a section for “real world” businesses for those who may not have the best computer skills. This article will provide just a few of the many small business ideas and will briefly detail how each business venture can be low cost. Are you an expert on a subject? Then you can be a consultant to help other businesses with their problems. With Clarity.fm, you can create a profile and charge a per minute rate that people will pay to call and speak with you. Whether you’re writing advertisements, articles or eBooks, content needs to be written. One area where content creation is always in high demand is in the social media sector. Creating content can be a low-cost venture because all that is really needed is a computer and a high-speed Internet connection, aside from a specific program needed for graphics (or other programming needs) that may require a startup fee. However, other than that the only thing content creation will cost is time. You can use services like TextBroker for steady business and while you’re trying to build a clientele. If you possess the artistic capability, then there are plenty of customers that need logos, graphics and artwork for their business. Websites like 99Designs, Fiverr and DesignCrowd make it possible to start getting business quickly, but building a clientele is what will keep the lights on. The software can make things pricey, but for about $20-$50 dollars each month, you can subscribe to Adobe’s software. If that is still too steep, you can start out with free alternatives like GIMP. Being an inventor used to be a far-fetched goal, or a term someone used to justify being crazy. That’s no longer the case! With crowdsourcing platforms like Kickstarter and IndieGoGo, funding is now possible to just about anyone. The added benefit to this model is that if you get funded, that is a decent indicator that you might just have a market. If your idea falls flat, then it might mean you need to go back to the drawing board. There’s no shortage of women who want to adorn themselves in beautiful jewelry. Pair that with the growing interest in handmade products made by local artisans and you have a recipe for success. Websites like Artfire and Etsy give you a low cost marketplace to sell your creations. Check out our article on making money with Etsy. Basically, you find interesting and valuable items at flea markets, thrift stores and just about anywhere else. You figure out what the proper value is, then you list it for sale. Sites like eBay and Craigslist give you the marketplace to move your new found goods. Forums are another great place you can sell things, as long as it is in accordance with the forum’s rules. This isn’t the typical kind most think of. We’re not talking about becoming a hit music star. We’re talking bread and butter making a living doing what you love type of musician. From being a studio musician at a music studio to writing beats, drops and jingles for businesses. You can make a living if you have the skills to do it. With software like Reaper (very inexpensive) you can have a music production studio right on your computer. Using sites like Fiverr, you can find your first customers to get things going until you have steady business. Similar to the graphic designer idea, but instead of designing things for yourself, you can design products to sell. With the help of websites like CafePress, Zazzle, SpreadShirt and RedBubble, you can have a store and products for sale in 1 day and no costs. Not too shabby! Connecting with people is an art. Some are good, some are great and others… well. You get the point. Connecting with customers on social media is something a lot of businesses don’t have time to do. The good news is, they have money and may need someone like you to manage that part of their business. Good communication skills are key as well as being up-to-date on the latest social media platforms like Instagram, Snapchat, Vine, Periscope and others. Know which platforms attract which kinds of people and how to engage communities on each one. Perfect for aspiring educators, one excellent business venture that takes very little money in terms of start-up costs is to create a virtual teaching and/or tutoring environment were a specific area of expertise or tutoring sessions can be conducted. A high speed Internet connection would be immediately required, time and effort will also be at the forefront during the startup process. Overall, the startup costs of running a virtual teaching/tutoring service carries virtually little to no costs. Alternatively, when it comes to tutoring old-school techniques (such as face-to-face) works just as well. Learning various computer oriented tasks is always something that will be in high demand. As a result, one way that you can help out the cause is by creating tutorials based on a specific (or multiple) computer programs that will teach a given client the ins and outs of using the program to complete various tasks. Of course, the best way to reduce the startup costs involved in this type of startup is to have the programs as well as any other related program to create manuals or how-to videos. Additionally, your startup costs may also include website fees if you are planning on having a dedicated website that all your operations are conducted through. Finally, in relation to the last point an Internet/phone service may also be of great use. A transcriber is someone who takes audio and transcribes it into text. This sounds like a dying field, but it’s actually growing because of internet video. Let’s face it: computers still aren’t great at recognizing speech. Businesses and entrepreneurs need their videos transcribed to text for people with hearing impairment as well as search engines to know what the video is about. Additionally, you’ll get business from people who simply want their audio recordings transcribed for easier reviewing and notation. You can find work on Fiverr and Upwork to start out. Similar to that of content creation, translation services require (at least in part) a given document that needs to be translated from one language to an entirely different one. While the skill set basically requires that the laborer be fluent in multiple languages immediate startup costs may include Internet/phone services as well as traveling expenses. Additionally, marketing expenses could also be factored into the startup costs. One note of caution: don’t do this unless you are fluent in other languages. Don’t simply try to use a service like “Google Translate.” While Google Translate is awesome, it doesn’t translate anywhere near perfect. Native speakers will easily be able to tell. People have aquariums and too little time. With the knowledge of how to take care of the different kinds of aquariums, you might be able to setup the perfect recurring business model. More people are working multiple jobs or have both parents working. It’s just a fact of the world we live in today. If it isn’t work, then the parents might just want a night out. This is where baby sitters come in. You can even set yourself apart by ordering a background check for yourself so you can provide trustworthy proof to help parents decide. In-home computer repair is still a definite need. Between people needing to recover accidentally deleted files, or needing a part replaced to get the computer working. In-home is an added convenience you can charge for. You can also set yourself apart by offering security services to help protect your customers such as encrypting hard drives and securing wireless networks. Perfect for clients whose daily lives are far too busy to schedule running a quick errand running a concierge service can be a good business venture for someone seeking for a way to help others. While the only initial startup costs may include some low-end marketing via business cards and other forms of advertisements keeping the car gassed up on a regular basis would be the only other recurring costs involved. This is not to say, of course, that there will not be any other fees involved as it is best to set money aside for incidental incidences that may come in the form of maintenance fees and vehicle upkeep. If you have a method of transportation, then you could be a courier. You can use services like Shyp to keep a steady flow of business. There’s no denying the majority of people thing very differently about their pets than they did 60 years ago. Pets are commonly considered family, and with that they get the treatment a family member deserves. Some busy pet owners might not have the time to walk their dog in the middle of the day or take care of them while away on work. That’s where you come in. Planning parties and other events is another low-cost business venture that can be both rewarding and fun at the same time. In looking at the basic overview this type of business all that is required (aside from Internet costs) are organization and some attention to detail. In addition to any Internet fees factored into the startup costs event planners may be required to make other additional purchases as it relates to the planning of a particular event; one such purchase would be a dedicated phone line. Using a service like TaskRabbit allows you to become an assistant to anyone. You post your profile, along with the tasks you’re good at, and people pick you to do those tasks for them. Don’t mind waiting in line? Yep, people will pay you to do that for them. If you know how to fix things around the house, then there are people that want to give you money. Installing ceiling fans and repairing drywall holes just might be the key to paying your bills! Do you have an interesting story, or something you’re very passionate about? Are you good at getting a message to some of the toughest crowds? If you aren’t afraid to get in front of groups of people then this might be perfect for you. Establishing a following on social media, and posting videos of you speaking are a great way to establish yourself first before trying to rent out and fill up speaking venues. If you have an able body and willingness to put in a hard days work, then a moving company might be a good fit. You can avoid the costs of buying a truck by renting a truck until you have enough business and capital to buy your own truck. You can use services like TaskRabbit to get your initial business going. What an excellent way to give back to others through the sound of music. Initially teaching someone how to play a particular instrument can be done either for free (for the first couple lessons) in an effort to generate more exposure and market yourself. In terms of travel, fees could either include regular vehicle maintenance as well as filling up the tank but additionally this can be as simple as taking a bus, random bike, or walking when meeting a client for a lesson. Finally, one great way to minimize the startup costs is to teach lessons on the clients’ instrument (such as their guitar) versus using your own. Do you possess a strong cooking skill set but are currently seeking for a way to turn your enjoyment for cooking into a business venture? If so, then becoming a personal chef is the route you take. As you may already know this particular career path would involve planning and preparing weekly/daily meals for a given client while adhering to particular nutritional values of a wide variety of different foods. In terms of start-up costs the fees are minimal at best as the majority of our cost will come from traveling expenses incurred when traveling to and from home, work, and the grocery store. Aside from that all other expenses should be covered by your client. With a few certifications and some time, you can turn your love for fitness into your livelihood. Help motivate others to reach their fitness goals and teach them proper technique so they don’t hurt themselves. You get the satisfaction of a good workout while helping others. Typically, this is something that would be done at a shop, but you could certainly take it mobile, especially with a service like iCracked. Many people think that if repairing a phone costs more than replacing it, then people will just replace their phone: they’re wrong. Phones contain really important data, so much so that people are willing to pay substantial money to recover the data. Phones now hold data like photos and not everyone backs everything up to the cloud! Despite people having amazing phones on their cameras, it is no replacement for skill and a good DSLR camera. People recognize this and still higher skilled photographers to capture important moments in their lives or for family photo shoots. With the proper licenses and a few people looking to buy or sell, you can get into the real estate business. Your friends and family will be a huge help in getting the word out about your new service! Don’t forget, real estate agents are also often used to promote properties that people want to rent out! It’s true that costs are increasing due to the need of credit card readers on the machines. That doesn’t mean an enterprising individual can’t make this business still work. Starting out with cash or change only machines will still yield business, just not as much. Place your machines in places that often have a cash paying clientele such as laundromats, small diners and flea markets to start. See if the owner of the location would like a profit sharing arrangement that way you only pay money if you’re making money. You could also partner up with a local charity or cause to help incentivize business owners to put your machines in their businesses. This article has proven there are several business opportunities that don’t require a large amount of money to start making more money. As many of the above examples have shown at most the startup costs that are most required when venturing out into the business world include traveling, and Internet/phone services. That said, there are existing business ventures that require absolutely no startup costs at all and well some form of marketing is always a plus it all depends on how elaborate the marketing techniques used really are.